Bali Elephant Ride and Uluwatu Tour is a Bali Combination Tour Packages we designed for your holiday by feel the experience Riding an elephant at Bakas Village and Continue visiting Uluwatu Temple in the south of Bali islands. This is great combination we offer to make your holiday more enjoyable by try the different tour experience which is do activities and adventure riding an elephant and visiting the best tourist destination of Uluwatu Temple. 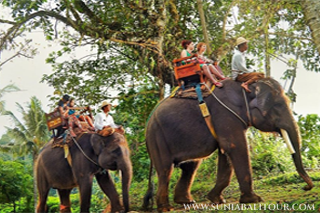 This Bali Elephant Ride and Uluwatu Tour will start to visit Bakas Village for enjoy the Elephant Ride through the jungle, cross the river and passed the Balinese village, is great view from the top of elephant and great moment too. Then the Bali Elephant Ride and Uluwatu Tour will continue visiting Garuda Wisnu Kencana to see bali cultural park with area 240 hectares large, then continue to visit the Pandawa beach or most know as a secret beach, is new beach recently open, then visiting Uluwatu Temple with breathtaking view of Indian Ocean from the temple. 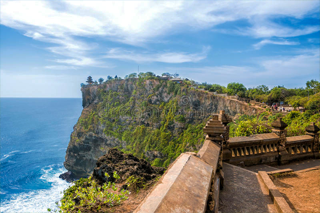 You will excited and impressed if first time see this temple, due Uluwatu temple located on the cliff with high 70 meter high and around the temple you will meet hundreds of monkey roaming and play each other. Is great experience, Below is description of places of interest will be visit during Bali Elephant Ride and Uluwatu Temple Tour. Bali Elephant Ride Tour adventure we offer is located in Bakas Village by offer Bakas Elephant Ride Tour Packages for 30 minutes ride, Klungkung regency with great scenery and amazing view of Melangit river, No doubt you will feel amazing experience you will not find in the city, in here you will like a King by riding an Elephant go along green bushes and side of river. During the Elephant Trip you will also see beautiful green hill and sometimes appearance of monkey's. Garuda Wisnu Kencana is a 240 hectares private social stop on the Bukit Peninsula at the southern end of the island of Bali in Indonesia. 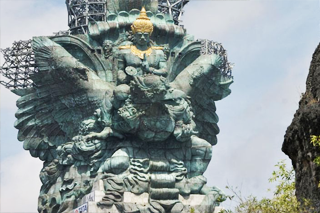 Inside have the statue of Vishnu is 23 meters (75.5 ft) high, despite the fact that the first arrangement was for a 146-meter (479 ft) gold-plated Vishnu riding Garuda on top of a 11 story amusement complex. Garuda wing compass will be 64 meters (210.0 ft) over. When its finished, it will be the biggest statue on the planet. Bali Pandawa Beach is located in Kutuh Village, South Kuta District, Badung Regency; around 3 km from the famous Nusa Dua area and Uluwatu Temple. In the past, this beach was hidden behind hill so it was called Secret Beach. Secret Beach actually had known well by some tourists. However, the difficult access to this location made this beach was empty. The visitors of this beach were only a few foreign surfers or domestic tourists. Fortunately, the local government of Badung Regency. Uluwatu Temple is a Balinese ocean sanctuary in Bali. Inherent the eleventh century, it is one of nine directional temple intended to shield Bali from wickedness spirits. The structure was altogether extended by a Javanese sage, Empu Kuturan in the eleventh Century. An alternate savvy from East Java, Dang Hyang Nirartha is credited for building the padmasana sanctums and is guaranteed to have achieved Moksha here. Significantly more wonderful than the sanctuary itself is its area.